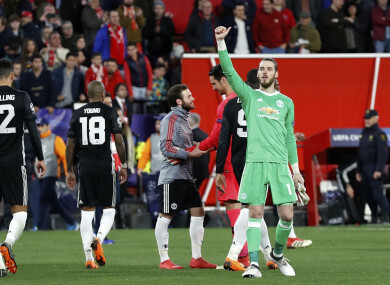 Manchester United goalkeeper David de Gea, right, gestures to the supporters at the end. NOT FOR THE first time on Wednesday night, United had David de Gea to thank for avoiding a loss. The Spanish goalkeeper has been comfortably the Red Devils’ best player for a number of seasons now. And while the 27-year-old made a few fairly comfortable or “statistics” saves as Jose Mourinho called them afterwards, De Gea’s acrobatic stop to deny Luis Muriel from close-range following a powerful header on the brink of half-time showed why most critics consider him to be a world-class player. United have had a disappointing few years by their high standards, but it would have been much worse were it not for the continually superb interventions of the influential Spaniard. If the club are to seriously progress under Jose Mourinho, it is vital they keep hold of their star man. While there are a number of talented goalkeepers active currently, such as Manuel Neuer, Thibaut Courtois and Hugo Lloris, it is hard to think of anyone looking more formidable than De Gea at the moment. If you were to judge Tuesday’s game at Stamford Bridge purely on possession, you would conclude Barcelona were the far better team — they had 73% of the ball. And yet Chelsea were not far off from securing a vital win in what manager Antonio Conte claimed was almost the “perfect” performance. Were it not for Andreas Christensen’s ill-advised pass and Lionel Messi’s clinical finish, Chelsea would have been going to the Camp Nou in a very strong position. Playing against a team that have had a below-par season in the Premier League, Barca struggled to live up to their billing as strong contenders to win this year’s Champions League. They may be top of La Liga, but their only serious challengers, Real Madrid, have been out of sorts in recent months. For all their nice build-up play, the Catalan side’s attack was looking somewhat toothless largely thanks to an impressively organised and diligent Chelsea backline. Despite controlling the contest for the most part, the visitors had fewer shots than their opponents and the same number of efforts on target (2), according to the BBC. Had Willian enjoyed better fortune, he might have had a hat-trick instead of seeing two spectacular efforts rebound off the woodwork. All of which does not bode particularly well for a side that many pundits have tipped to triumph in this year’s competition, even if they remain favourites to progress ahead of the finely balanced second leg. Anyone who knows Jose Mourinho well can hardly be too surprised at United grinding out a 0-0 draw in the Champions League on Wednesday night. Sevilla controlled the majority of contest but could not find a way past a stubborn Red Devils backline, with the visitors’ attacking players such as Romelu Lukaku and Alexis Sanchez largely on the periphery of the game. In away matches, Mourinho has a history of effectively parking the bus — that famous defeat of Barcelona in the Champions League during his time at Inter especially springs to mind. Last November, several outlets assessed United’s record in away matches against fellow ‘big six’ teams — it read: nine games, no wins, one goal. Wednesday’s match indicated that despite yet more money recently being pumped into the club in the form of the January acquisition of Alexis Sanchez, not much has changed in terms of the Old Trafford outfit’s approach in these matches. Mourinho, as the ultimate ‘results manager,’ might claim the end justifies the means. However, for a club of United’s ambitions and resources, unless they can pull off something pretty spectacular between now and the end of the season, it is hard not to imagine supporters growing tired of the Special One’s controversial tactics, which RTÉ pundit Didi Hamann went so far as to deride as “anti-football” after the Sevilla match. Email “The best goalkeeper in the world and more Champions League talking points”. Feedback on “The best goalkeeper in the world and more Champions League talking points”.